In today’s #tbt feature, we remember the historic flight of the Double Eagle II in August 1978—the first balloon flight to cross the Atlantic. Double Eagle II launched on August 11 from Presque Island, Maine, carrying Ben Abruzzo, Maxie Anderson, and Larry Newman. Almost six days and 4,987 kilometers (3,099 miles) later they landed safely in France. This was the fourteenth known attempt to cross the Atlantic by balloon. The first attempt, in 1873, made it only 72 kilometers (45 miles), while the 13th attempt made it almost—but not quite—to France earlier in 1978. 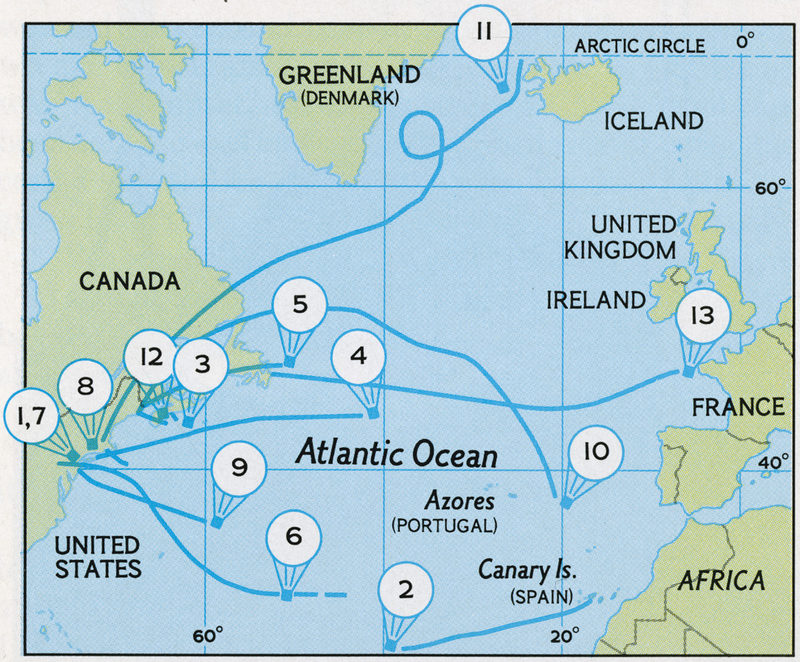 This map shows the first 13 known attempts to cross the Atlantic by balloon, from the Daily Graphic in 1873 to the Zanussi in 1978. 1. The Daily Graphic (1873) makes it about 73 kilometers (45 miles). 2. The crew of the Small World (1958) tries and east-west route, and ends up sailing about 2,414 kilometers (1,500 miles). 3. The Maple Leaf (1968) crew ditches southeast of Halifax, Nova Scotia, Canada. 4. The Free Life (1970) and her crew vanish. 5. The Yankee Zephyr (1973) crew is forced to ditch her after sparks appear. 6. The Light Heart (1974) is spotted over the Atlantic, but then disappears. 7. The Spirit of Man (1974) bursts over the New Jersey coast, killing its captain. 8. The Odyssey (1975) reaches as far as Cape Cod, Massachusetts. 9. The crew of the Spirit of ’76 (1976) was rescued near Bermuda. 10. The Double Eagle (1977) came down near Iceland. 12. The crew of the Eagle (1977) ditched her southeast of Halifax. 13. The Zanussi (1978) came closest to success, ending off the coast of France. Why did Double Eagle II succeed when so many failed? The crew had a few advantages. 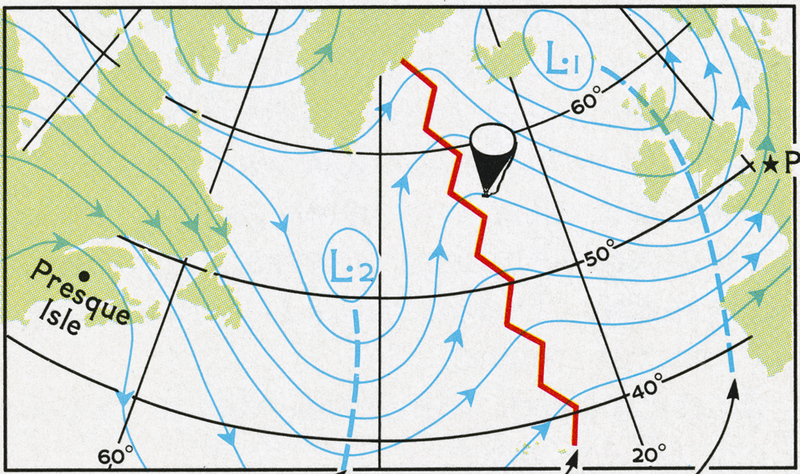 Weather conditions were decent—Ben and Maxie had tried to cross the Atlantic a year earlier, but a storm ended that trip off the coast of Iceland. They also had experience: “Success in any venture is just the intelligent application of failure,” said Anderson. And they brought an extra crew member, Larry Newman, who was able to fix the radio around Day 3, allowing communication with the ground crew and better navigation. Along with the usual supplies like water, food, and emergency equipment, the crew brought oxygen to help them breathe—they flew above 4,572 meters (15,000 feet) for about 1/3 of the trip. Read about altitude and oxygen here. They also brought folding lawn chairs, a pair of battery-powered electric socks to prevent frostbite, and a hang glider that Larry wanted to fly into Paris at the end of the journey. Food for the trip included bagels, salami, nuts, soup, and juice. The crew’s plan was to climb quickly to high altitude and maintain it in order to take advantage of higher wind speeds. They also wanted to catch a migratory high pressure system, a mass of air that rotates slowly clockwise as the mass moves from east to west. After a high pressure ridge (red line), Double Eagle II catches an air system heading for France. The chart below shows Double Eagle II’s altitude during the flight—click to enlarge! After 40 hours, the craft hit a downdraft and lost 1,067 meters (3,500 feet), but carefully released ballast to lighten the load. A few days later, atmospheric conditions forced a much bigger drop to 1,219 meters (4,000 feet), the lowest point on the journey. By releasing more ballast, the Double Eagle II was able to climb back to 7,605 meters (24,950 feet), the highest point on the trip. Putting the graph in geographic, this illustration tracks the altitude of the Double Eagle II. As they approached the west coast of Ireland, the crew finally released the hang glider over the sea, then crossed the island of Great Britain and the English Channel, and finally reached France, where they began their final descent. Double Eagle II glided over a cornfield and landed in a field of barley in the small village of Miserey, west of Paris, where they were greeted with cheers. Learn more about the Double Eagle II and the perils of long-distance balloon travel! Read much more about this historic flight in the December 1978 National Geographic article “Double Eagle II Has Landed.” (Check with your local library). The gondola of the Double Eagle II is now on display at the Smithsonian Air & Space Annex in Chantilly, Virginia. Learn about the very first balloon flight in 1783. Try a science experiment regarding balloons. Watch an National Geographic video on the science of hot air balloons.